This weekend, televisions around the world will tune into to watch the first race of the 2014 FIA Formula One Championship take place in Melbourne, Australia. Of particular interest to all F1 fans will be the new looking cars with their revolutionary new power units. Formula One has undergone another drastic change in the rules, prompting engine manufacturers to clean-sheet design an integrated turbocharged electric-combustion powertrain system. As they are constantly striving to improve on-track performance, and given the extreme time constraints of competitive motorsport, the traditional product design process of "design-manufacture-evaluate-redesign" does not allow enough potential designs to be evaluated by F1 teams to remain competitive. By leveraging a Simulation Driven Product Design process, F1 teams are testing more designs in faster timeframes, and thus more efficiently working to optimise the final design and extract maximum possible performance within the new rules. Of all the engineering challenges present in F1 racecar engineering, this advantage is most prominent in the field of fluid dynamics: affecting both external aerodynamics and internal flows. Given that the engine dimensions and fuel tank size are now even more strictly controlled, in order for a team to get more power out of the engine than their competitor, they must put more fuel and air into the engine. For every tenth of a gram of air that the team can force into the engine per cycle, approximately 13 extra kilowatts of shaft power can be produced. While not all of that energy makes it into the rear wheels, the resulting increase in power is still immense. To deliver the most air into the cylinder, it is now legal for teams to compress the air by use of a turbocharger (a change which is welcomed by many fans who love that turbo sound!). For optimum turbocharger design, engineers turn to ANSYS CFD and associated Workbench design tools such as the TurboTools suite which provides highly advanced integrated tools including BladeGen/BladeModeller, TurboGrid, special Turbo Pre and Post-Processing Macros as well as Vista tools. ANSYS CFD allows turbocharger designers a faster turnaround on designs and works on templates that produce dependably accurate results. For external aerodynamics, the advantage of virtual prototyping also gives teams the ability to quickly evaluate and advance their design. 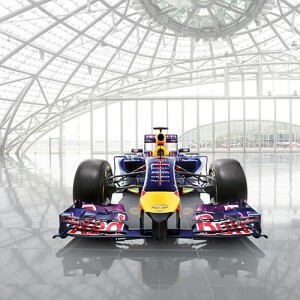 A prime example of on-track performance realised through ANSYS CFD is Infiniti Red Bull Racing; a long time ANSYS technology Partner and the F1 Championship winning team for the last 4 years. The 2014 FIA rules call for lower noses and a reduction in span of the front wing. Because the nose cone and front wing are the first parts of the car to hit the oncoming air, they influence the flow-field of the entire car and are vital to the overall aerodynamics. Nowhere is this more relevant than in the flow into the undertray of the car; which is one of the main downforce generating devices. A lower nose reduces the cross-sectional area of the air that feeds the undertray, and so aerodynamicists have had to work hard to make up some of this lost ground. Furthermore, the newly controlled exhaust outputs mean that diffuser interactions are no longer easily possible, meaning that modifications have to be made to the entire rear of the car in 2014. If you'd like further insight into the cutting-edge use of CFD at F1 teams, ANSYS will be conducting a webinar on March 27 with Al Peasland, Head of Technical Partnerships, Infiniti Red Bull Racing & Nathan Sykes, Team Leader for CFD and FEA, Infiniti Red Bull Racing. To learn more about how ANSYS performs at the pinnacle level of engineering, we encourage you to for this not-to-be-missed event via this link.